The president of Katsumi Electric Co passed away in March, 2011, and it appears that the family has no interest in keeping the comapny going. Apparently they have been unable to find someone to take it over, so we are no longer able to get Katsumi products. These were excellent products that were a part of the communciations scene in Japan and it is a shame to see them go. Katsumi Electric Co. has been making commercial keyers since the 1960's, their equipment has an unsurpassed reputation for rugged reliability. Katsumi equipment is used in virtually all testing environments in Japan including amateur, commercial, and military. Morse Express is Katsumi's agent in North America, and all of the products shown on this page are stocked and usually available for immediate delivery. Other products are available by special order. 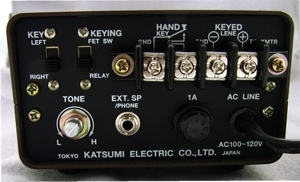 The EK130 Deluxe Electronic Keyer is a commercial grade electronic keyer, and this is the keyer used in Japanese Morse examinations. All of the controls are mounted on the front panel, along with a "speed meter" which displays the operating speed in words per minute, characters per minute (both PARIS and CODEX), and Japanese commercial radio class test speeds. Terminals are provided for connecting a paddle and/or bug and/or straight key. 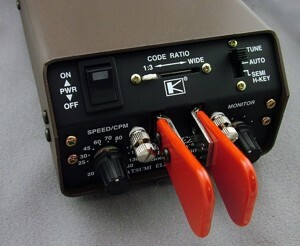 The keyer itself will function in "bug" (semi-automatic) mode at the flip of the front panel switch. The Katsumi paddle is heavy duty all the way, from its attractive "retro" style to its heavy cast-iron base. It is not a precision instrument, but has a surprisingly light feel at a very reasonable low price. In fact it would seem to be the only standard paddle on the market at less than $100, and better quality than many more expensive paddles. The pivots feature steel ball and cup bearings, and the contacts are machined hard silver. The KM23 paddle weighs 2 Lb 10 Oz. Base diameter is 4" diameter, paddle maximum height is 2" and the lever length is 4"
Katsumi's EKM2B Code Practice Oscillator is without a doubt the nicest sounding and most flexible unit on the market. 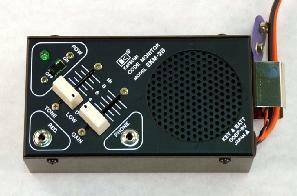 Whether you are learning to send, or teaching a class, or practicing over a repeater, the EKM2B will do everything you need. The circuit is a transistor oscillator, producing a pleasant near-sine-wave tone that you can listen to comfortably for hours. The oscillator is transistor keyed for chirp-free operation at high speed. Features include an on/off switch with green LED, separate sliders for pitch (600-1800Hz) and volume, headphone jack, and "record" jack to provide line-level (4mV 600 Ohm) audio for tape recorders and other devices. The EK160 Electronic Keyer / Paddle is a commercial grade electronic keyer with a precision dual paddle built in. 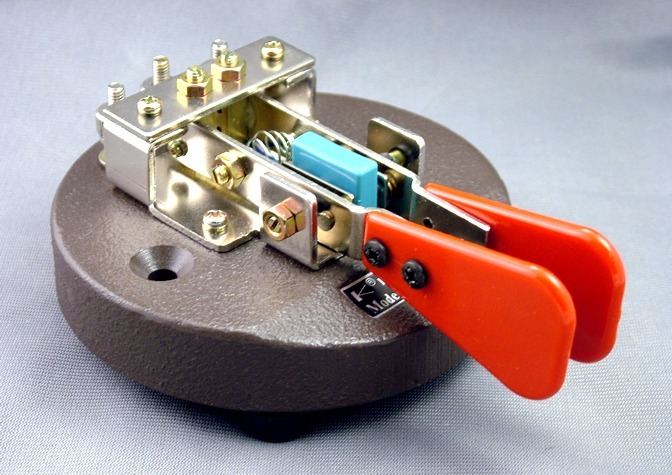 Terminals are provided for connecting a paddle and/or bug or straight key (to use the keyer as an oscillator and to buffer the keying of a transmitter via the relay). 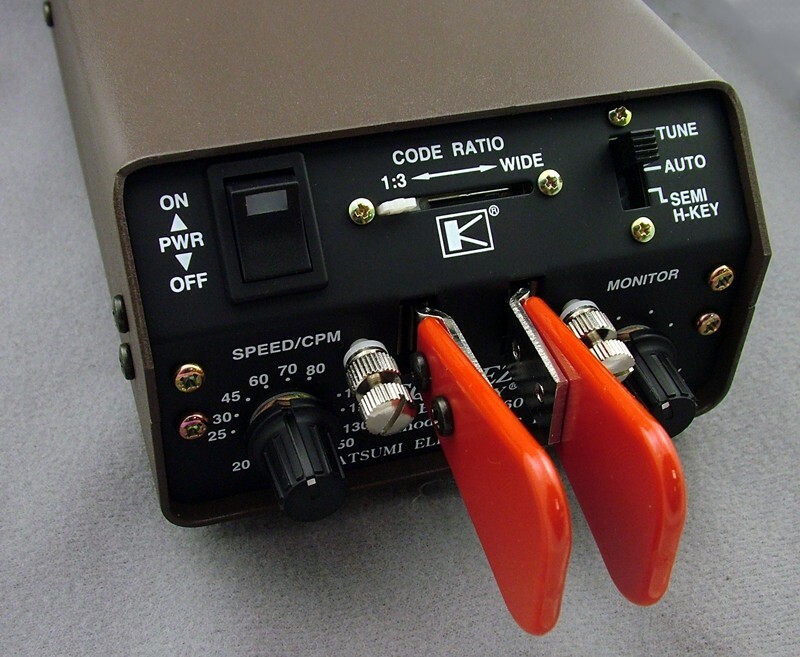 The keyer itself will function in "bug" (semi-automatic) mode at the flip of the front panel switch. Speed setting is done via a front-panel control which is calibrated in characters per minute (5cpm = 1wpm, approximately ). The adjustable paddles are switch-reversable for left-handed operators, and the contact spacing is easily adjusted on the front panel. Iambic keying features full dot and dash memories. The weighting ("code ratio" can be adjusted from 1:3 to about 1:4. There's a built in monitor with volume control on the front panel and pitch control on the back, and a jack for headphones or external speaker (8 Ohms, 300mW). Built-in high-speed reed relay supports negative-keyed rigs with up to 280VDC and 2A on the key line, or use JFET keying for transistor-keyed +V rigs and save wear and tear on the relay..
Size/Weight: 9x4x2.5in, 2 Lbs, 12 Oz. If you are a user of these Katsumi telegraphic products, your comments could be here! Write to us via the link below, and please be sure to say specifically that we can use your comments on the web page.